New Speed Management Action Plan Development Package Now Available! The State Traffic Records Coordinating Committee Noteworthy Practices Guide is Now Available! Updated Pavement Friction Web Page Now Live! We consistently champion a data-driven, evidence-based approach to safety investments. Using data and analytic methods to inform decision making is the most effective way of targeting resources to maximum effect. In the Office of Safety, like Carlos Santana says, we "Practice What [We] Preach" when it comes to allocating our resources—we call it the Focused Approach to Safety. As we all know, there is a disconnect between the scale and scope of the challenges we face and the resources we have to meet those challenges. So, to most effectively target our technical assistance and technology deployment, we first analyze data on the three types of crashes that have the highest numbers of fatalities—roadway departure, intersection, and pedestrian. We then concentrate this assistance on what we describe as "Focus States"—States that have the biggest challenges in these areas. We provide these Focus States with priority access to our Office's resources. While all States may come to us for technical assistance, we will prioritize Focus State requests. We implemented the Focused Approach in 2004 and periodically update the criteria for the program to take into account new data and feedback from the States. We last updated the Focused Approach in 2011 and just released the list of new Focus States this July. We used the latest three-year average of available data (2011-2013); added bicycles to the pedestrian focus area; and, in response to State DOT feedback, adjusted the selection criteria to remove a bias toward the larger States. The information on the Focused Approach to Safety can be found at http://www.safety.fhwa.dot.gov/fas, and I encourage all of you to visit the site to get more detail on this approach. As always, if you have any comments, please send them to the program manager listed on the site. The Data-Driven Safety Analysis (DDSA) Team has been working hard to spread the word about the benefits of data-driven safety analysis, and people are listening. For the past several months, FHWA has been reaching out to the States in a variety of ways, including conducting workshops and training, presenting at conferences and meetings, holding webinars, and, to top it off, hosting an Every Day Counts Exchange on DDSA for State, local, and tribal agencies that was attended by nearly 600 participants across 120 locations. The DDSA effort was launched under the third round of the FHWA Every Day Counts initiative. Its objective is to incorporate safety performance into all highway investment decisions by broadening implementation of predictive and systemic safety analysis. The goals of DDSA are to achieve more informed decision-making based on an understanding of quantified safety impacts, to optimize investment by applying the most current analytical methods to determine benefits and costs, and to improve safety by supporting proactive application of countermeasures at locations with the highest potential for improvement, thus effectively reducing fatalities and serious injuries. Nearly half the States have contacted the team for technical assistance, including the New York State DOT, which requested a gap assessment for its current safety analysis processes and has welcomed assistance in follow-up activities. In addition, the Ohio Department of Transportation (ODOT) has decided to incorporate predictive crash analysis into their Project Development Process for all highway projects. ODOT has discussed the training that will be needed to implement this change and is currently working to incorporate the appropriate Highway Safety Manual (HSM) analysis into the project development task list and project initiation package. The ODOT Central Office is also meeting with district staff to discuss revising ODOT's design exception process. The new process will use ODOT's SafetyAnalyst list to identify design exception locations that require further safety analysis and review. The Team also provided systemic safety training and an executive overview for the Maine Department of Transportation (MDOT) on June 10. This training was critical in supporting the newly formed Safety Committee that was charged with developing recommendations for the division of funding between systemic and reactive safety projects and developing procedures for data-driven systemic safety project selection. The committee includes representatives from Safety, Traffic, Planning, Project Development, Maintenance, and FHWA. The Committee is currently analyzing head-on and run-off-road crashes, which are over represented compared with road mileage, for Priority 1 and 2 roadways. In addition, the DDSA team has been providing technical assistance and training to the New Jersey DOT on an ongoing basis every 4-8 weeks. The team has worked with New Jersey on projects where staff has hit a snag. They have also assisted New Jersey in applying HSM methodologies to situations that don't perfectly match up with the HSM example problems. The team hopes to turn some of this material into a workshop to help advance other States through similar issues. For more information and resources on the DDSA initiative, please visit https://www.fhwa.dot.gov/innovation/everydaycounts/edc_4/ddsa.cfm. If you have questions about the initiative or are interested in technical assistance, please contact Jerry Roche at jerry.roche@dot.gov or John McFadden at john.mcfadden@dot.gov. 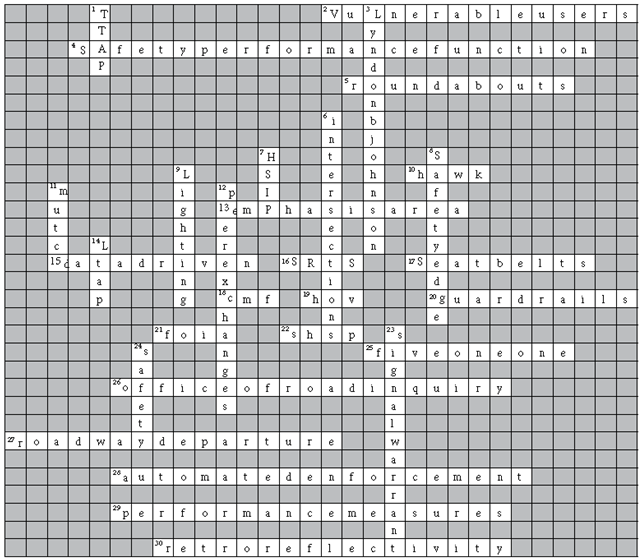 Download a printable PDF of the puzzle. 2 Pedestrians, cyclists, and the elderly. 4 Calculate crashes under different scenarios using this. 5 One of the safest intersection types. 10 Avian-sounding ped safety countermeasure. 14 Elements each State SHSP must identify. 17 Safe Routes to School, in short. 18 These reduce crash-related injuries and deaths by half. 19 Lower values on this indicate higher impact countermeasures (abbr.). 20 Acronym for carpool lane. 21 This steel barrier keeps you away from fixed-object hazards. 22 Acronym for the law that gives citizens the right to access information. 23 The master safety plan and a component of 7 down (abbr.). 26 Three-digit source of real-time road and transit info. 27 1893 predecessor to today's FHWA. 28 In 2015, FHWA identified Alabama as a focus State for _______. 29 Red-light cameras are an example of this. 30 Quantifiable indicators used to assess progress. 31 Unlit road signs are visible at night due to this engineered characteristic. 1 Provides transportation training and technical assistance to tribal governments (abbr.). 3 President who signed into law the creation of USDOT. 6 In 2015, FHWA identified New Jersey as a Focus State for ped/bike and ___________. 7 A safety funding source and core Federal-aid program (abbr.). 8 Rural road drop-off mitigation. 9 Installed to help drivers see pedestrians, bicyclists, and the roadway configuration more clearly at night. 11 Read this before you "sign." 12 These FHWA-run events help you learn from and share with your counterparts. 15 Source for local-level training, information, and technology updates (abbr). 24 Intersections should meet at least one of these before a signal is installed. The Office of Safety has recently developed two new resources designed to encourage transportation agency leadership and safety stakeholders to improve their effectiveness in executing the strategies identified in the State's Strategic Highway Safety Plan (SHSP). The revised "Leadership That Saves Lives" flyer (available at: http://safety.fhwa.dot.gov/hsip/resources/fhwasa1102/flyr2_ld.pdf) is designed to build awareness among key leaders about the important role they play in the SHSP process. The flyer offers examples of proven State approaches and practices that could inspire leaders to recommit to their State's SHSP goals. It also offers important tips for connecting and holding a successful dialog with internal and external safety partners, energizing and encouraging partners, and tackling roadblocks to clear the way for successful implementation of important safety strategies. Does your State have a new transportation leader who isn't familiar with the SHSP process? Do current safety leaders appreciate how critical their role in SHSP development and implementation is? Leveraged resources, such as implementing low-cost safety improvements combined with high-visibility enforcement, which may improve safety more than either strategy alone. We encourage readers to download and circulate these updated flyers to your State SHSP partners, especially those in departments of transportation and State highway safety offices. The flyers can be included in briefing packages to leadership and distributed at SHSP/safety summits and other meetings and conferences. For more information on these flyers or other SHSP resources, please contact Jennifer Warren at jennifer.warren@dot.gov. Speeding – defined as exceeding the posted speed limit or driving too fast for conditions – is a contributing factor in over 30 percent of all fatal crashes with annual costs exceeding $52 billion. Within the FHWA Safety Focus Areas, speeding is a significant factor in roadway departure crashes, with about 41 percent of run-off-the-road fatalities being speeding related. Nearly one-quarter of intersection fatalities are speeding related. Although the percentage of pedestrian fatalities that are speeding related is low, travel speed at impact adversely influences the severity of pedestrian crashes. The average risk of death for a pedestrian reaches 10 percent at an impact speed of 23 mph, 25 percent at 32 mph, 50 percent at 42 mph, 75 percent at 50 mph, and 90 percent at 58 mph. The new Speed Management Action Plan Development Package is designed to help State and local agencies identify effective solutions to speeding. Speeding is a national safety issue, but effective solutions depend on local and State agencies. As of December 2013, 44 States include speeding in their Strategic Highway Safety Plans, either within the context of aggressive driving and enforcement or as one or more engineering strategies for managing speed. 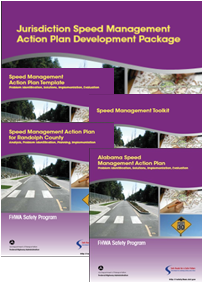 The Alabama Speed Management Action Plan as an example of a statewide action plan. The Template guides the user through the process of developing an SM action plan, which includes procedures for identifying problems and potential solutions, processes for selecting actions and prioritizing countermeasures that ultimately lead to setting appropriate safety goals, and implementing actions to meet those goals. The Template includes steps for identifying and targeting countermeasure implementation through a systematic process as well as guidance to proactively and comprehensively address jurisdiction-wide speed management issues. The Toolkit contains descriptions and links to more information and tables of crash- and speed-reducing countermeasures that agencies may consider to address identified safety problems. It also provides tip sheets to help develop effective communications strategies that support both the program overall as well as particular countermeasure strategies. The local plan and the statewide plan provide detailed examples to help other agencies develop their own action plans. The new Speed Management Action Plan Development Package is designed to help State and local agencies identify effective solutions to speeding. You can find the Package posted on FHWA Safety website at: http://safety.fhwa.dot.gov/speedmgt/ref_mats/. For questions or additional information on any of the elements of the toolkit, please contact Guan Xu at guan.xu@dot.gov. Serious crashes are a major concern on local roads throughout the country. In 2013 alone, more than 12,000 people were killed on local roads—a fatality rate almost three times that of the Interstate highway system. Local elected officials play a key role in local road safety: they set goals, adopt policies, build coalitions, and approve budgets. These officials, however, typically face many demands for their time and many requests for funding. "Many local elected officials and agency practitioners are working collaboratively to develop effective safety solutions to save lives on their roadway network in communities large and small," said Rosemarie Anderson, LRRP Manager at FHWA. "These videos and brochures are designed to provide local elected officials with information that can lead to the positive results in safety realized by those who are already employing a collaborative, action-oriented safety process." Learn about road safety issues in their communities. Collaborate with practitioners and local safety partners to find the right solutions. Take action to make roads safer. Be a champion for transportation safety. Communicate the facts in clear, concise language, supplemented with compelling stories of actual crashes and success stories from similar communities. Build and maintain relationships with safety stakeholders to gather information and reinforce support for initiatives. Educate listeners about proven, effective, low-cost solutions, and scale proposals to a level that local officials can address. Involve officials in road safety events and offer public acknowledgment of their support. A PowerPoint template was also created for practitioners to use when meeting with their elected officials and other stakeholders. The template includes talking points, key facts, case studies, and photographs. Agency staff can use the template as a foundation to tailor their own messages, plans, and proposals. All the materials are informative and engaging, with content that is non-technical and easy to understand. An advisory group of stakeholders—local elected officials, city and county engineers, and other practitioners from various regions—helped determine content and shape the materials. The video includes relevant safety experiences from members of the advisory group. For example, Linda Langston, supervisor in Linn County, Iowa, and a strong champion for safety, speaks emphatically about collaboration and action. Steve Latoski, public works director in Mohave County, Arizona, discusses the need to provide regular updates on safety issues and projects to local elected officials to continually get the message out that traffic safety-related concerns of residents as well as constituents are being addressed. Ultimately, the goal of the new materials is to reduce crashes and save lives. "Working together, local elected officials and agency practitioners can make roads safer in their communities—for all road users," Rosemarie Anderson emphasized. The outreach videos, brochures and power point template as well as other local and rural roads safety information and products will soon be available online at http://safety.fhwa.dot.gov/local_rural. For more information, please contact Rosemarie Anderson at rosemarie.anderson@dot.gov. Designed for Traffic Records Coordinators, State and local DOT staff, and MPOs, the State Traffic Records Coordinating Committees Noteworthy Practices Guide contains detailed information on how several TRCCs have met with success by developing noteworthy structures, management practices, and business processes. The Guide also contains recommendations and resources for States to help achieve improvement and increase effectiveness of TRCCs. The Guide was produced through the Roadway Safety Data Program and is now available at http://safety.fhwa.dot.gov/rsdp/downloads/trcc_noteworthy.pdf. For more information about the guide, please contact Esther Strawder at esther.strawder@dot.gov. 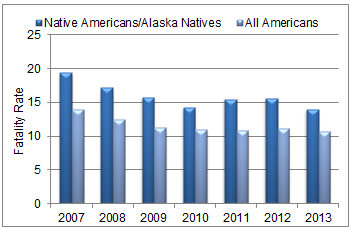 Between 2007 and 2011, 2,752 Native Americans were killed in motor vehicle crashes. Of those fatalities, 20 percent were under the age of 21, 34 percent resulted from speed-related crashes, and 49 percent resulted from alcohol-related crashes. Additionally, motor vehicle crashes are the leading cause of unintentional injury for Native Americans under the age of 44. Tribes can prevent or reduce the severity of motor vehicle crashes and other transportation safety hazards through transportation safety planning efforts. Transportation safety planning is particularly critical for improving safety and quality of life for Native Americans. The "Tribal Transportation Planning Module Training Series" provides modules for eight planning topics, designed to assist transportation professionals responsible for planning for capital, operating, and maintenance needs on tribal lands. The FHWA Office of Planning produced this series, available at https://www.fhwa.dot.gov/planning /processes/ tribal /planning_modules/, to educate tribal planners and decision makers about the tribal transportation planning process and to provide them with useful program information. The series offers modules in transportation planning, transportation programming, intergovernmental relations, and safety and asset management. The newest module in the series is "Developing a Transportation Safety Plan," available at https://www.fhwa.dot.gov/planning/processes/tribal/planning_modules/safety/chapter00.cfm. This module provides a brief overview of how to conduct transportation safety planning and describes how tribes can develop transportation safety plans (TSP), which are documents that identify transportation safety issues and strategies to address them. TSPs can cover multiple transportation modes (driving, bicycling, boating, etc.) and multiple types of facilities (roads, trails, water transportation, etc.). TSPs may lead to new projects or programs, renewed efforts within an existing program, or further study of specific locations or safety issues. Transportation safety planning allows tribes to take a proactive approach to prevent crashes and improve unsafe transportation conditions. For more information on these or other tribal transportation safety resources, please contact Michelle Noch at michelle.noch@dot.gov. The Office of Safety has just unveiled the updated Pavement Friction web page, which features a streamlined, more user-friendly design that promotes user engagement and provides easily accessible information. The updated page also features an increased focus on high-friction surface treatments, or HFST, a safety tool that has been proven to reduce crashes dramatically when properly applied on horizontal curves. The new Pavement Friction web page includes the entry page plus five subpages, which offer detailed information on the friction management program, traditional friction treatments, high-friction surface treatments, case studies and noteworthy practices, as well as FAQs, links, and other resources. Each page contains updated information and links to resources related to the page's topic as well as to partner sites that offer additional information. The noteworthy practices and case studies pages provide users with the latest information on research and findings from real-world applications of different treatments. The new content is designed to inform and provide guidance to representatives of State and Local DOTs, safety advocates and practitioners, the FHWA Division Offices, as well as our safety partners at industry associations and among researchers who improve road safety by improving pavement friction. Visit the new page at http://safety.fhwa.dot.gov/roadway_dept/pavement_friction/ and check out the our new content and products! For more information about the Office of Safety's Pavement Safety Program, please contact Joseph Cheung at joseph.cheung@dot.gov. On June 22, 2015, it was a clear, sunny Monday afternoon at the FHWA Federal Outdoor Impact Laboratory (FOIL)—the ideal weather conditions needed to carry out the scheduled full-scale crash test. The pavement was dry and the test car was ready to go. The vehicle used for the test was a small, four-door sedan with a total weight of 2,585 pounds, which falls under the Test Level 3 category as designated by the AASHTO Manual for Assessing Safety Hardware, which is the current roadside safety hardware testing state of the practice. 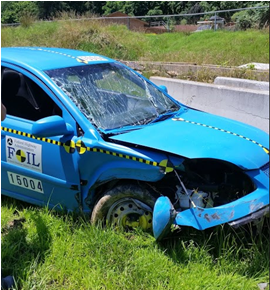 With a crash dummy in the driver seat, the vehicle was attached to a pulley system that accelerated it to a speed of 60 mph towards a row of precast concrete barriers at an impact angle of 25 degrees. The barriers were fixed rigidly in place just beyond the end of the vehicle runway for this test. Vehicle after crash, view of impacted area. 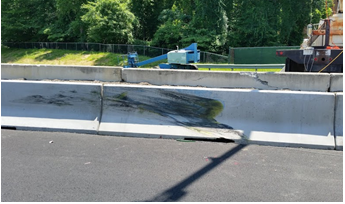 The jersey barrier after impact. The test lasted approximately 5 seconds, but a great deal of information was obtained during that brief time. Upon impact, the vehicle deflected away without rolling over, as can be seen in the clip taken from video footage. The results were measured and recorded using high speed cameras aimed at the point of impact, accelerometers mounted in the vehicle, and speed measuring devices at the end of the runway. This crash was one of several that have been conducted to evaluate a friction-reducing coating for application on concrete barriers to diminish the occurrence of vehicle rollover and upward redirection upon impact. If testing determines that the coating functions as anticipated, it is possible that a car striking the barrier may be more smoothly redirected instead of being vaulted into the air or overturning. Previous tests have also been conducted as part of this research. In the beginning, researchers selected a test design that is different from the standard crash criteria for roadside hardware for the first round of testing, because they knew that those conditions were more likely to cause a vehicle to roll. In these tests, the vehicles were loaded with four simulated passengers, and the impact angle was 10 degrees. Two tests, one with a small sedan and the other with a pickup truck, were performed on an untreated barrier, which resulted in the vehicle rolling over and the passenger compartment being crushed. The tests were then repeated under the same conditions, but with the barriers treated with the anti-friction coating. The vehicles in the treated barrier test scenario did not overturn, so the passenger compartment remained intact. Vehicle after uncoated barrier test crash (left) and vehicle after coated barrier test crash (right). Source: USDOT FHWA YouTube video. As it happens, the test conducted in June 22 was one of the control cases, so the barrier used was not treated with the anti-friction coating. Another test was conducted using a pickup truck under the same conditions, which also resulted in no rollover. The results of the tests with the untreated barrier will be compared to previous tests, as well as additional tests scheduled for early August. The scheduled tests will be performed under the same conditions as the last two except the concrete barriers will be treated. Even though neither vehicle overturned in either of the last two baseline tests, the treated barrier tests will be conducted to see if there is any positive safety effect. During first round of testing in September 2014, two crash tests were performed. One used an uncoated concrete barrier, and the other used a coated concrete barrier. The difference in these crash tests, in comparison to the one performed on June 2015, was the weight of the car and the impact angle. The tests in 2014 had the weight of four simulated passengers instead of one, and the impact angle was 10 degrees instead of 25 degrees. The test using the uncoated concrete barrier resulted in vehicle rollover, which left the passenger compartment crushed, whereas in the coated concrete barrier scenario, the vehicle did not roll over, so the passenger compartment was not crushed. The research performed as part of the FHWA FOIL is vital for the development and advancement of road safety technologies. To find more information on additional research done at the FOIL, please visit www.fhwa.dot.gov/research/tfhrc/labs/foil. Special thanks to Senior Test Technician and FOIL Manager Christopher Story and to Nick Artimovich and Esther Strawder from the FHWA Office of Safety for their contributions to this article. Local agencies (cities and counties) own and maintain about 92 percent of Kansas' road network, and, as in many States, the number and expertise of local agency staff varies. Smaller agencies may not have the resources or expertise needed to apply for Federal funds and administer the process to completion. To address this gap, in 2010, KDOT's Bureau of Local Projects initiated an innovative Federal Fund Exchange (FFE) program to help local agencies get the most out of their Federal dollars. Under the FFE program, any city or county with a population greater than 5,000 is eligible to exchange its Federal funds for State funds through KDOT on a reimbursement basis. The State reimburses up to 90 percent of the local government's Federal-aid allocation for local projects, as costs are incurred. Exchanged funds can be used for construction, maintenance, or safety-related projects anywhere they are needed, including on roads not eligible for Federal aid. A gravel road resurfacing project using county workers. Chip sealing and patching, which are considered "maintenance" improvements. Slurry sealing on residential streets. A small steel girder bridge replacement project using county forces. Projects that need a funding boost have also benefitted from the program; one example is a complex intersection project that included special paving materials, signals, and lighting. The city combined FFE funds with other funding sources to construct a much larger project with special features that would not have been eligible for Federal aid. The FFE program is designed to allow local agencies greater flexibility in using funds as well as increased project control. KDOT does require documentation to prove that State funds are being spent as intended, but overall the agency has seen a positive response to the program as local agencies are now better able to meet their most pressing needs, and there is much less overall oversight required by KDOT. By 2014, KDOT had committed over $84.9 million in exchange dollars across the State to be used on local projects by eligible local governments. As of October 2014, $51.5 million have been reimbursed. The majority of the funds have been spent to date on resurfacing and bridge maintenance or replacement projects. While these are not Highway Safety Improvement Program projects, they do contribute to a safer travel experience and enable local agencies to identify and implement safety improvements as needed without undertaking the Federal-aid process. Although the State DOTs own and operate the Interstate System, FHWA is required to approve all new access or changes in access points pursuant to 23 U.S.C. 111. The Pennsylvania Department of Transportation (PennDOT) identified a need to modify an existing set of interchanges due to their operational, geometric, and structural deficiencies. Several roadway characteristics were substandard, including horizontal and vertical curvature and acceleration and deceleration ramp lengths. Additionally, the existing interchanges are approximately 4,000 feet apart, and AASHTO recommends 3 miles between interchanges in rural areas. These deficiencies, coupled with increasing volumes, have created significant delays and decreased safety in operations. As a result, PennDOT submitted a Conceptual Point of Access (CPOA) request to the FHWA Pennsylvania Division Office for I-70 in western Pennsylvania (south of Pittsburgh). The CPOA focused primarily on two alternatives in addition to the no-build option. The first, Alternative 2A, retained two closely spaced interchanges with some mainline improvements. The second, Alternative 3, removed one of the interchanges and added a new connector road and local roadway network improvements. While both alternatives appeared to be acceptable based on engineering and operations review, the FHWA Interstate System Access Informational Guide contains eight policy requirements that must be addressed for Interstate access modifications. Policy point three requires "that the proposed change in access does not have a significant adverse impact on the safety and operation of the Interstate facility." In addition, with concerns over the public's reaction to removing an existing interchange, PennDOT wanted a strong case for its removal, not just the recommended AASHTO requirement. Recent developments with the Highway Safety Manual (HSM) and safety analysis tools, including Highway Safety Design Model (IHSDM), offer a data-driven approach to supporting and strengthening the analysis required in policy point three. To assist with the evaluation of the operational and safety effects of the proposed project alternatives, the Division office coordinated with the FHWA Geometric Design Laboratory through the FHWA Office of Safety Research and Development to utilize the IHSDM software tool. The FHWA Geometric Design Lab compiled the necessary data to run IHSDM, including average annual daily traffic (AADT), crash data, and alternative geometrics. 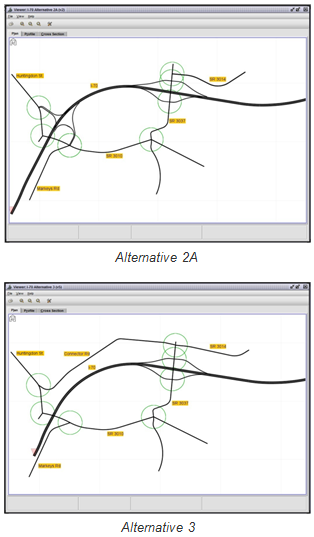 Surprisingly, the tool revealed that Alternative 2A (retaining the closely spaced interchanges) was superior to Alternative 3 (removing one of the existing interchanges) in terms of expected safety performance. The Geometric Design Lab documented the analysis and findings of the safety evaluation in a report that was provided to the division office to support their response to the CPOA request and the identification of a preferred alternative. Subsequent to the CPOA approval, FHWA received approval from PennDOT to use the I-70 IHSDM report as a case study in a training course that is being developed by the FHWA Resource Center. The course "HSM Predictive Methods for Freeways" introduces the new freeway methodologies chapters of the HSM (Chapters 18 and 19) and will demonstrate the use of safety analysis tools, including IHSDM, to evaluate freeways and interchanges. In addition to hosting a pilot of the new course, PennDOT has recognized the value of the HSM and associated analysis tools and has recently updated its design manuals to encourage the use of HSM tools to evaluate various project development activities, including POAs and design exceptions. 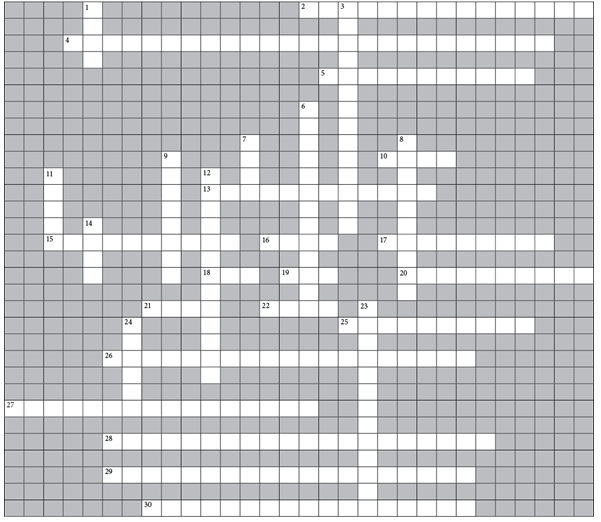 It has also developed a user-friendly spreadsheet tool to analyze rural two-lane roads, rural multilane highways, and urban/suburban arterials. Finally, PennDOT is currently developing regional Safety Performance Functions (SPFs); and has instituted HSM training statewide. If you have questions or want more information about Pennsylvania's experience using the IHSDM software to evaluate the I-70 POA or other HSM implementation activities in Pennsylvania, please contact Phillip Bobitz, P.E. at Phillip.Bobitz@dot.gov. Gov. 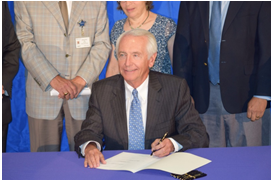 Steve Beshear signs Kentucky's enhanced booster seat law on June 15, 2015. Governor Steve Beshear joined local officials, child-safety advocates, and medical staff at the University of Kentucky on June 15 in a ceremony to sign long-awaited legislation to improve child passenger safety in motor vehicles. House Bill 315 brings Kentucky's booster seat law in line with 31 other States, including all seven neighboring States. The previous law required children younger than 7 years old and between 40 and 50 inches in height to ride in booster seats. The enhanced bill increases the height requirement to 57 inches and the age requirement to 8 years old. Children younger than 8 but taller than 57 inches will not have to ride in a booster seat. "Passage of this bill provides greater safety and protection to our most precious asset – our children," said Gov. Beshear. "I commend the many advocate groups who have long-supported this legislation and both chambers for working together to enhance Kentucky's booster seat law." Effective June 24, 2015, the bill requires law enforcement officers to issue citations with a $30 fine and no court costs. In addition, violators will have the option to purchase a booster seat instead of paying the fine. A properly installed, belt-positioning booster seat lowers the risk of injury to children by nearly 60 percent compared with using seat belts alone, according to the National Highway Traffic Safety Administration. Transportation safety is a major problem on tribal lands. In 2013, the Centers for Disease Control identified motor vehicle injuries as the leading cause of death for American Indians and Alaska Natives aged 1-44. In many States fatal crash rates are several times over-represented among the American Indian populations compared to all other races. In the 4 years from 2010 to 2013, there were 1,721 deaths of Native Americans and Alaska Natives from roadway crashes reported in the Fatality Analysis Reporting System (FARS). Studies have shown that these alarming statistics are probably even more severe because they are based on information that is highly likely to be underreported. FHWA's Tribal Transportation Program (TTP) is leading an effort to re-establish the Safety Management System (SMS) Steering Committee, a group comprising stakeholders from both Tribal and Federal Governments and the Tribal Technical Assistance Program. The purpose of the SMS Steering Committee is to identify strategic activities that will have a high probability of decreasing fatal and serious injury crashes in Indian Country. Some of these activities will be implemented by the committee while others activities can only be implemented by encouraging individual tribes to take action. In 2008, the SMS Steering Committee worked with tribal partners to develop a Strategic Highway Safety Plan (SHSP); an Implementation Plan was developed in 2011. The goal of the Implementation Plan was for tribal governments to develop Tribal Highway Safety Improvement Programs (HSIP). Use a multi-disciplinary, data-driven approach to update the 2008 Strategic Highway Safety Plan (SHSP) for tribal lands to generally address transportation safety needs in Indian Country in coordination with other agencies and tribal governments. Update the 2011 Safety Management System (SMS) Implementation Plan. Identify a budget and resources to fund the committee's further efforts. 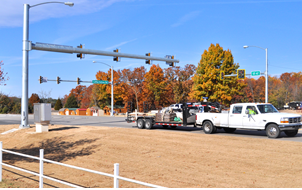 Partnering with Oklahoma DOT, Cherokee Nation used funding from the Tribal Transportation Program (TTP) and a grant from the TTP Safety Fund to improve safety at the intersection of US-62 and Cherokee Street. Photo credit: Cherokee Nation. 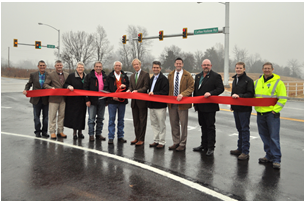 Cherokee Nation used TTP funding for this project intended to improve traffic flow and reduced crashes and near misses experienced at this intersection, which provides access to the Cherokee Nation's Health Clinic, Head Start, and High School. Photo credit: Cherokee Nation. The new SHSP for tribal lands will take a fresh look at the supporting data. Depending on the method used to define "crashes impacting tribal lands," the number of annual fatalities to be considered could be as high as about 3,100 in 2013. The SMS Steering Committee will formalize its charter in late September 2015. The committee will meet quarterly, with additional subcommittee and task-related meetings held on an as-needed basis. For more information on SMS Steering Committee activities, please contact Russell Garcia, Russell.Garcia@dot.gov, 202-366-9815 or Adam Larsen at Adam.Larsen@dot.gov, 360-619-7751. The SMS Committee had a significant role in the establishment of the Tribal Transportation Program Safety Fund (TTPSF), which is modeled after the Highway Safety Improvement Program in that it encourages each tribe to develop a Strategic Transportation Safety Plan similar to state SHSPs. Individual projects must be supported by a strategic planning process and by crash history (like the eligibility criteria for HSIP). Also, the TTPSF uses the eligible activities list from HSIP (23 USC 148). Each year, the grant is funded at around $8.5M under MAP-21. All federally recognized tribes identified on the list of "Indian Entities Recognized and Eligible to Receive Services from the Bureau of Indian Affairs" are eligible for grants under this program. In 2013 and 2014 the TTPSF received requests for funding that were more than 3.5 times the amount of available funding. The Southwest Region of Virginia is largely rural and features signals that are spaced widely apart, with a few pockets of density along urbanized corridors. 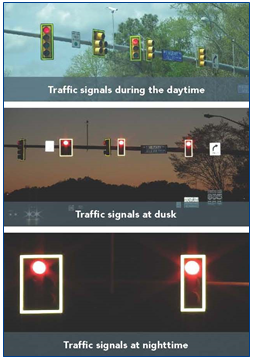 As part of the Virginia Department of Transportation's (VDOT) vision for reducing crashes and fatalities at signalized intersections, the agency opted to use the systemic installation of retroreflective backplates on signal heads throughout the region. This counter-measure was selected for the potentially positive impact it might have on reduced intersection crashes by increasing the conspicuity of signals. In determining the locations for treatment, VDOT began with already identified Corridors of Statewide Significance (COSS), which Virginia's Long-Range Multimodal Transportation Plan defines as an "integrated, multimodal network of transportation facilities that connect major centers of activity within and through the Commonwealth and promote the movement of people and goods essential to the economic prosperity of the State." To determine the preferred installation method, VDOT began by asking Regional Operations Maintenance Managers to contribute ideas on best installation methods and retrofit options. The agency also reviewed installation methods employed by other States to identify the one that would work best for Virginia. Working from there, VDOT selected a few intersections to try out various installation techniques before moving forward with region-wide installation. VDOT opted to install new backplates with the retroreflective border already in place, saving valuable time in the field installation and ensuring quality workmanship. VDOT Southwest Region also had the staff capacity for installation so they justified the use of State forces following Federal-aid contracting requirements. This also created efficiencies and cost savings. Within a year, VDOT will have installed retroreflective backplates at all 129 intersections on Southwest Virginia's COSS signals. VDOT plans further retroreflective backplate installation on other major corridors, high-speed locations, and locations where visual clutter detracts in the Southwest Region and other regions of the State. Retroreflective backplates are a cost-effective, proven countermeasure with a benefit-cost ratio of 10:1. VDOT intends to perform a before-after study once future crash data becomes available, but is confident there will be a safety improvement at these intersections, since the projected crash reduction is 15 percent for total crashes and 29 percent for fatal/injury crashes. If you have further questions or would like to learn more about Virginia's experience with retroreflective backplates please contact Anne K.C. Booker, P.E., PTOE – SW Assistant Regional Traffic Engineer at Anne.booker@vdot.virginia.gov or 540-375-0143 or Ritchie Robbins, P.E., PTOE – Senior Signal Systems Engineer at Don.robbins@vdot.virginia.gov or 804-371-2536. With the 5-year anniversary of the release of the Highway Safety Manual (HSM) upon us, it's a great time to highlight the value of Safety Performance Functions (SPF), one of the advances the HSM introduced for safety analysis. Safety Performance Functions are statistical models used to estimate the average crash frequency for a specific site type (with specified base conditions), based on traffic volume and roadway segment length. SPFs are introduced in great detail in both Parts B and C of the HSM along with required data needs. FHWA recently posted a Virginia case study highlighting the noteworthy efforts the State has made with developing its own State-specific SPFs. Virginia's Department of Transportation (VDOT) emphasizes data-driven decisionmaking and continually strives to improve its safety program and safety data system. As a result, the agency implemented a comprehensive set of SPFs covering 98 percent of its State-maintained roadway locations. VDOT developed State-specific SPFs using historical crash, traffic volume, and roadway inventory data. SPF developers had to work closely with engineers throughout the development process to ensure that each SPF would function for all types of improvements (spot, corridor, and systemic). To date, VDOT has 24 SPFs available for a majority of roadway facilities, including two-lane roads, intersections, and freeways/multi-lane highways. Other States have also initiated SPF development and performed calibration in recent years. The list continues to grow, and more resources are currently available on the RSDP website (http://safety.fhwa.dot.gov/rsdp/) such as guides and case studies to assist with SPF calibration and development. The table below contains some of the States that have submitted SPF documentation to FHWA to demonstrate their progress in this area. 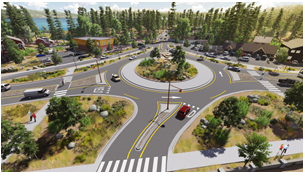 The Central Federal Lands Highway Division (CFLHD), FHWA Resource Center, and California Division are working together with local agencies in Tahoe City, CA to improve safety for vehicles, pedestrians, and cyclists. Funded through the Federal Lands Access Program (FLAP), the Truckee River Bridge Project proposes improvements to resolve the existing, deteriorated condition of the Truckee River Bridge (locally known as "Fanny Bridge") and the existing traffic congestion at the intersection of State Routes (SR) 28 and 89. The proposed improvements are designed to enhance motorized and non-motorized user safety and mobility, reduce traffic congestion, provide for anticipated future increases in traffic, increase access across the Truckee River, and encourage revitalization of the local Tahoe City community. The project includes construction of three new roundabouts, two new bridges, and improved connectivity of existing sidewalks and bike paths. SR 89 will be realigned as a new two-lane segment of highway that will cross through the U.S. Forest Service's (USFS) 64-Acre Tract. The western end of the new segment will begin at a new single-lane roundabout, which will serve as the new SR 89/SR 28 intersection. A new bridge over the Truckee River will be constructed immediately to the southeast of the roundabout on the new roadway segment. The new alignment will continue east and reconnect to existing SR 89 at a single-lane roundabout. Realignment of SR 89 and construction of the new bridge will include modifications to the existing Caltrans maintenance facility, construction of retaining walls, realignment of an existing sewer main line, and realignment of existing bike paths. 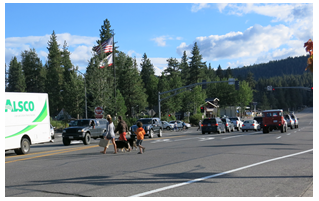 Safe pedestrian and bicycle facilities were primary concerns for the Tahoe City community. Photo by Hillary Isebrands.. Artist's rendering of the new Fanny Bridge Roundabout with new pedestrian facilities. Image courtesy of the Tahoe Transportation District. Fanny Bridge will be rehabilitated or replaced to address the existing structural deficiencies and resolve pedestrian and vehicular safety and community concerns. Traffic calming and aesthetic features will also be installed within this section of roadway (e.g., reduced speed limit, bulb-outs, landscaped areas, raised landscaped median, on-street parking, sidewalks, street lighting, benches, etc.). New parking and/or landscaping may replace the existing free-right turns. During the preliminary design phase for the project, CFLHD and the FHWA Resource Center worked with the local agencies (California Department of Transportation (Caltrans), Tahoe Transportation District (TRPA), Placer County, USFS, Tahoe Regional Planning Agency (TRPA), and the Tahoe City Public Utility District (TCPUD)) to ensure the project addressed the safety and context-sensitive needs of the Lake Tahoe community. The three proposed roundabouts are being designed to minimize the footprint and handle the appropriate design vehicle(s) and Caltrans maintenance vehicles (snow plows and sweepers). A field demonstration was conducted with the CalTrans snow plows and sweepers to ensure the size and shape of the proposed roundabouts is sufficient for maintenance operations. 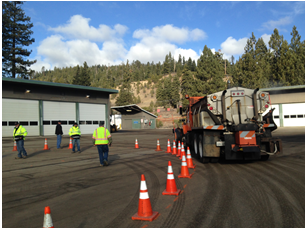 The project team set up cones in the Caltrans maintenance yard in Tahoe City, laying out the minimum inside center island diameter of the roundabouts, and had the snow plow and street sweeper negotiate around the cones. One of the three roundabouts is proposed to be elliptical in shape in order to reduce the footprint of the project and avoid private right-of-way impacts. The field demonstration allowed the project team to make minor adjustments to the roundabout diameters early in the design process to ensure the Caltrans maintenance staff could successfully complete their snowplow and street sweeping operations. The project team set up cones representing the minimum inside center island diameter of the roundabouts and had the snow plow and street sweeper negotiate around the cones to ensure the size and shape of the proposed roundabouts is sufficient for maintenance operations. Photo by Hillary Isebrands. Due to a request by Placer County and the TRPA to address vehicle, cycling, and pedestrian safety around Tahoe City, in April 2015, the FHWA Resource Center and CFLHD conducted a pedestrian and bicycle Road Safety Audit (RSA). The RSA included the limits of the Truckee River Bridge Project and also extended into Tahoe City. The goals of the RSA included balancing pedestrian safety and vehicular movements in and through Tahoe City, providing safe pedestrian and bicycle movements within Tahoe City along SR 28, coordinate and leverage current and planned projects within Tahoe City, and enhance pedestrian crossings through implementation of proven strategies and countermeasures. 2015 AASHTO Annual Meeting, September 24-28, 2015, Sheraton Chicago Hotel and Towers (http://www.aashtoannualmeeting.org/). The Annual Meeting offers transportation executives the opportunity to network and share the latest in industry policies and innovations. Its focus will be on the collaboration and innovation that helped shape our national transportation system. ITS World Congress 2015, October 5-9, 2015, Bordeaux, France (http://itsworldcongress.com/). Through the main theme "Towards Intelligent Mobility – Better Use of Space", the Bordeaux Congress will focus not only on how achieving intelligent mobility will change our lives but also on the benefits space can bring to ITS applications. International Walk to School Day, October 7, 2015 (http://tinyurl.com/qhu5928). Join millions of parents, teachers and community leaders across the globe by encouraging your children to walk to school in celebration of International Walk to School Day. Fifth International Road Safety and Simulation Conference, October 6-8, 2015, Orlando, FL (http://stc.utk.edu/STCevents/rss2015/). The RSS series showcases advancements in traffic simulation and driving simulator technologies, introducing new initiatives and concepts that have emerged since the first RSS conference in Rome, Italy in 2007. Institute of Transportation Engineers (ITE) 2015 Technical Conference and Exhibit. October 28-31, 2015, Tucson, AZ (http://tinyurl.com/nathte7). This Technical Conference & Exhibit will showcase a wide range of products and services related to logistics and transportation. Transportation Research Board (TRB) 95th Annual Meeting, January 10-14, 2016, Washington, DC (http://tinyurl.com/2b6yqg8).The meeting program will cover all transportation modes, with more than 5,000 presentations in nearly 750 sessions and workshops. The theme for the 2016 TRB Annual Meeting is "Research Convergence for a Multi-Modal Future," and the full 2016 program will be available beginning in November 2015.